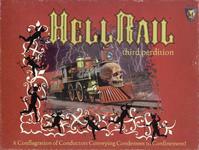 Mayfair's update of the Galloglass game, HellRail (Second Perdition). There are several refinements, but the major change is the addition of many more circle powers and the circle powers are now randomly distributed (and can change during the game). The train engines are wood instead of pewter.